In 2016 we had the opportunity to travel across the US, from Oregon to Florida and back again, in our 1994 Ford Bronco. We camped, hiked, explored, and found that our favorite area for outdoor adventures was in Northern Arizona, right along the Utah border. The bright orange sandstone formations dotting the rugged landscape of Northern Arizona conjures images of life in the Wild Wild West. When cowboys and Native Americans roamed the land on horseback in a lawless land. Where people traveled for hundreds of miles over these barren lands in search of a new life. When you visit Northern Arizona today it still feels like that – barren, rugged, remote. Much of the beauty in this area has remained untouched and is relatively easy to access and enjoy by all. You could spend months exploring all of the spectacular areas of Northern Arizona (and you should) but we’ve listed our favorites here so you can ensure you see the highlights. And the best part about these amazing destinations is that although many of them are popular, the areas are vast so you can find your own piece of paradise to enjoy all to yourself! Read all about road trip packing essentials here! In Kanab, Utah, The Flagstone Boutique Inn and Suites is reasonably priced and conveniently located near the BLM office (in case you want to try for The Wave in-person lottery). Rooms are clean and spacious and offer nice views of the surrounding mountains. You’ll feel right at home here! 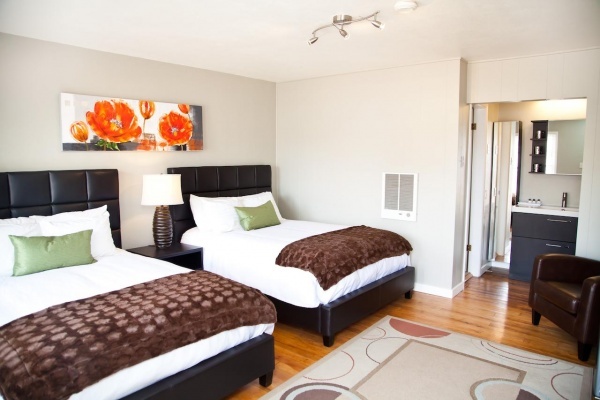 Country Inn and Suites by Radisson in Page, Arizona is right near both Horseshoe Bend and Antelope Canyon. 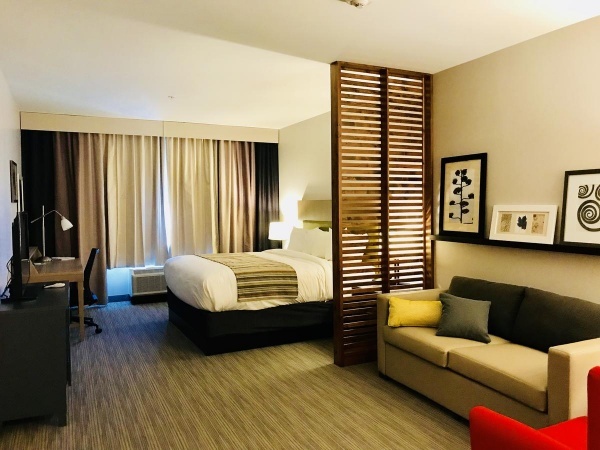 Offering large, comfortable, clean rooms and an indoor pool and jacuzzi, you may never want to leave! They offer a buffet breakfast as well to get you fueled for a day of exploring the area. 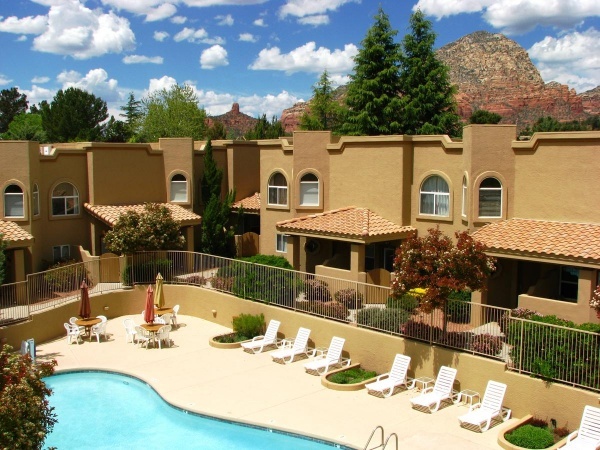 Sedona Springs Resort is a moderately priced hotel surrounded by the beautiful nature of Sedona. Offering a large outdoor pool and a gym for guests to use, it’s the ideal place to spend a few days in-between exploring all that Sedona has to offer. Rooms are large and well-equipped. Arizona is known for having an extremely hot climate, especially in the summer months when it’s not uncommon for temperatures to rise about 100 °F for days or even weeks at a time. Much of Northern Arizona sits at a higher elevation so summer temperatures are milder and it can be quite cold in the winters. Snow is common in several of the destinations outlined below. If you visit during the winter be sure you have warm clothes and chains for your vehicle, just in case. Sedona is an exception as it is closer to central Arizona and typically experiences summers that are quite hot and mild winters. Havasu Falls is an area of land in the Grand Canyon that belongs to the Havasupai Indian Tribe. It is deep inside the Grand Canyon, 10 miles from the nearest road. 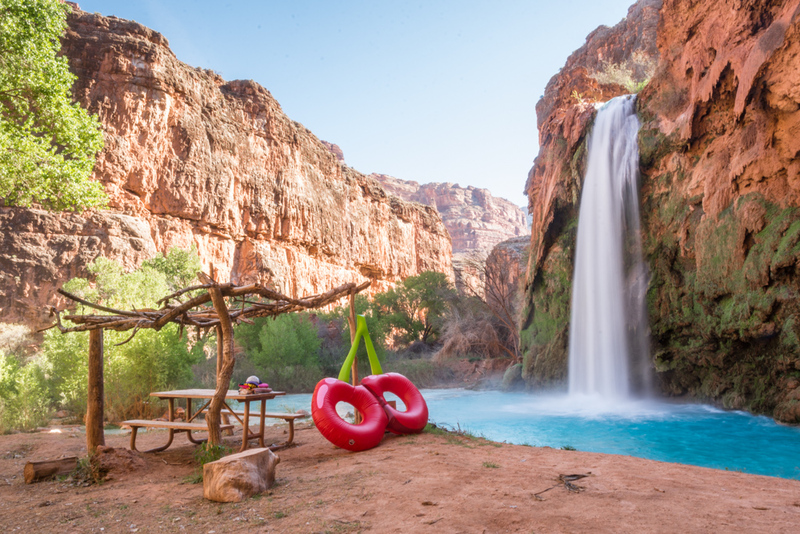 In order to access the area you must plan on camping at the Havasu Falls Camground for at least one night and you’ll either need to hike in, take a helicopter, or ride a horse. The main attraction, Havasu Falls, is one of the most picturesque waterfalls in the entire United States. Milky turquoise blue water cascades down orange limestone cliffs that appear as if they are melting. But Havasu isn’t the only beautiful waterfall in the area. Closer to the Supai Village you’ll find Little Navajo Falls and a few lovely swimming holes at the top of the falls. Further down the river (the descent is tricky and not for the faint of heart) you’ll find the massive Mooney Falls. It is similar to Havasu Falls only more difficult to access and much taller. And a few miles further is Beaver Falls which is ideal for swimming. The entire area is surrounded by massive cliff walls, lush vegetation, and travertine sentiment which gives the water the milky effect. It is truly spectacular and an area that should be on everyone’s bucket list! In order to visit Havasu Falls you’ll need a camping permit that is issued through the Havasupai Reservation. Day visitors are not allowed. Permits go on sale on February 1st and permits for the entire year sell out within a few weeks. Read all about what to pack for Havasu Falls here! Read all about how to purchase a camping permit online here! The season is open to campers from February 1 – November 30 but the most popular time to visit is during the warmer summer months. Temperatures can be quite cool in February, March, October, and November so you probably won’t spend a lot of time swimming under the waterfalls. However, these times are far less popular so you find fewer crowds. The area of southern Utah and northern Arizona is full of vibrant, colorful sandstone rock formations, some of which have become slot canyons through centuries of erosion. The most famous of those is Antelope Canyon. Located on Navajo land just east of Page, Arizona, there are actually two canyons here – Upper and Lower Antelope Canyon. Both are on Navajo land so the only way to visit is by guided tour. Upper Antelope Canyon is a very narrow slot with towering canyon walls stretching high above you. Some areas are so tight that it’s difficult to pass the people going in the opposite direction. It is a popular spot with photographers as the midday beams of light filtering into the canyon create a gorgeous effect on the sandstone. If you don’t visit at the right time the canyon is actually rather dark and not ideal for photographing. Lower Antelope Canyon requires climbing down a set of metal stairs to enter and the opening in the top is much larger than its counterpart. So the vibrant, swirling sandstone is illuminated all throughout the day. It is also less popular than the upper canyon so you’ll enjoy fewer crowds and not feeling as rushed by your guide. 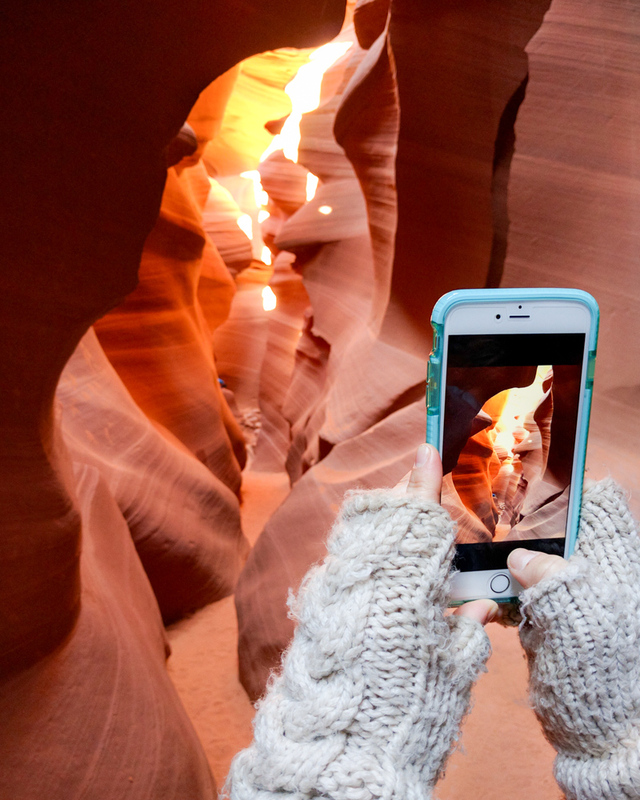 Antelope Canyon is a popular tourist destination so you’ll want to reserve your spot, just in case. Tours of both run frequently each day as long as there is no threat of a flash flood. If you are staying in Page, Arizona, the Lower Canyon is about 5 miles east of the town along AZ 98-E and the Upper Canyon is right nearby (although your guide will be driving you to the canyon in a truck once you park your car and pay). The tours are relatively expensive but we would recommend doing both. The canyons are quite different and each is amazing in its own way. However if that’s not in your budget or if you don’t have time, Lower Antelope was our favorite to explore. 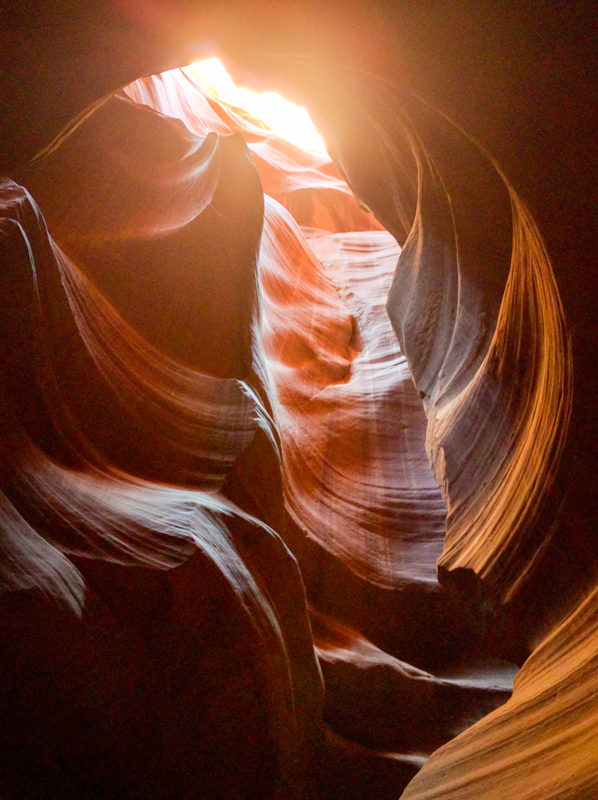 The most popular time of year to visit Antelope Canyon is in the summer months when the lighting is the most impressive within the canyon walls. January and February are in the off-season and offer better rates and fewer crowds. There is a danger of flash floods so you will not be able to visit if there is any potential risk. To tour the Upper Antelope Canyon the price is $45.50/person (including the Navajo Park Permit fee and taxes) but the price is increased to $58.50/person to visit during the 11:30am time slot. Secure your advanced reservation here. To tour the Lower Antelope Canyon the price is $40/person + $8 Navajo Park Permit fee + 5% sales tax. You can book your tour in advance here. 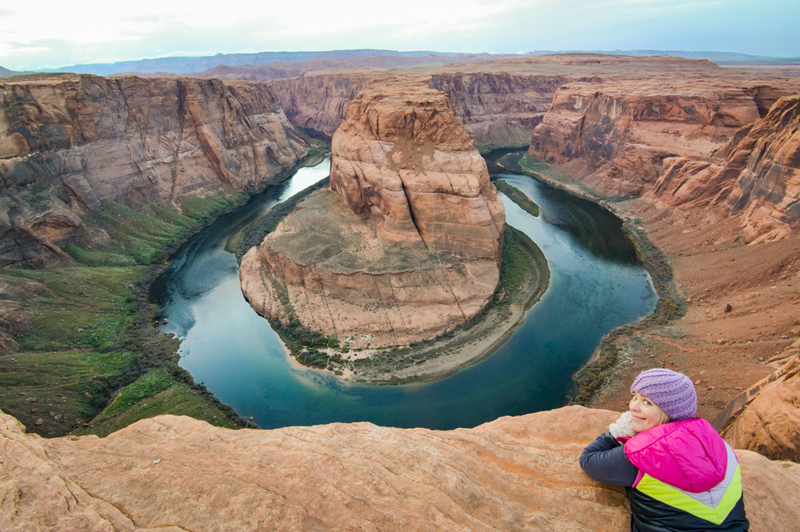 Horseshoe Bend is the section of the Grand Canyon where the river does a complete 180 around a bend in the rock (resembling a horseshoe) and the view from the top is spectacular. The overlook is 4,200 feet above sea level and the dizzying drop from the sheer cliffs would be about 1,000 feet. There are no guardrails and nothing is off-limits so you can wander around and check out the view from all angles. The turquoise blue water of the meandering Colorado River with the giant orange rock formation raising from the center is truly a breathtaking view. It’s easy to get to and definitely worth the trip to see it in-person. Plus it’s right near Antelope Canyon and Lake Powell! There is a small parking lot off of US Route 89 as well as parked cars lining the highway when the parking lot fills up. It’s a short, 1.5 mile round trip walk from the lot although it’s a steep uphill climb. You can visit this overlook at any time of the year but you’ll probably enjoy it more if it’s not raining or snowing as it would potentially be slippery and also freezing cold. 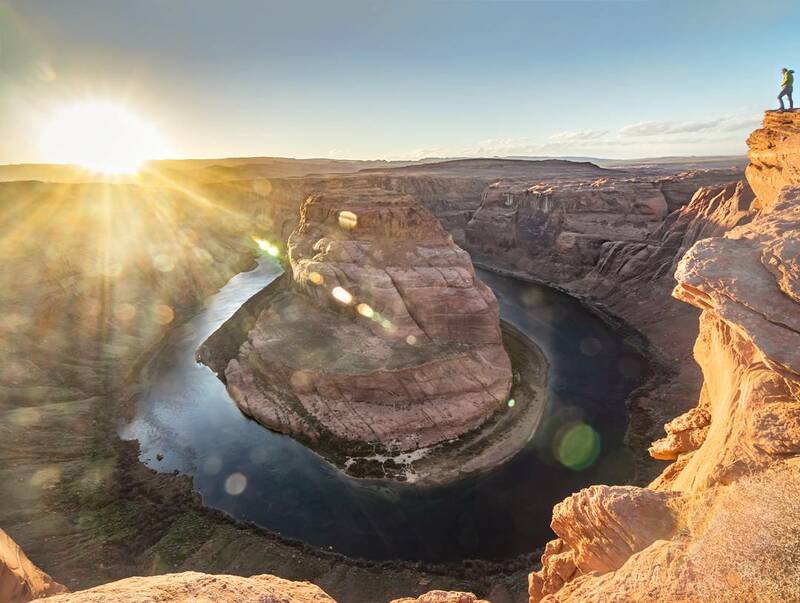 Horseshoe Bend also tends to draw the biggest crowds right around sunset which makes sense as you get to see the sun set over this epic landscape. If you want a more peaceful visit you should go early in the morning. 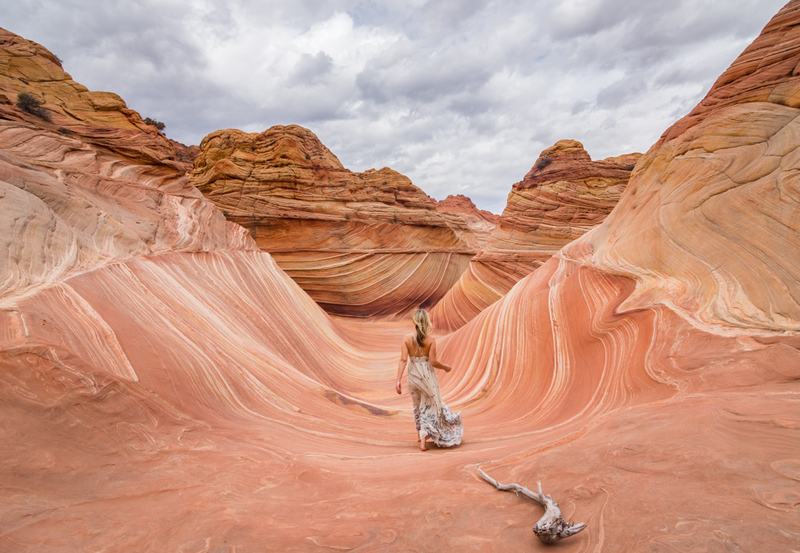 This area of Northern Arizona has gained notoriety because of one small, specific area of the Buttes known as The Wave. This rock formation is indeed truly stunning as the orange and white swirls are perfectly aligned to form a shape that really closely resembles an ocean wave. But what most people don’t realize is that the area surrounding The Wave is vast and equally as beautiful (and also much easier to access). The orange and yellow swirling sandstone covers the entire area and creates a fascinating landscape. You’ll get lost wandering around while admiring the colors and textures. And since only 20 people are allowed to visit each of the Buttes every day, you’ll pretty much have the entire area all to yourself! There are two buttes that are referred to as South Buttes and North Buttes and the Wave is located within the North Buttes. You’ll need a permit to access both area and those are assigned by the Bureau of Land Management office located in Kanab, Utah through a lottery system. Only 20 permits are given out daily to each of the buttes; 10 through the online lottery and 10 through the in-person lottery. You must apply online 4 months in advance and thousands of people throw their names in the hat. And the in-person lottery is drawn daily for a permit for the following day. Hundreds of people cram into the small BLM office in the hopes that their number will be drawn. The permit process for the North Buttes is far more competitive than the process for the South Buttes and both are certainly worth exploring. Read everything you need to know about the in-person permit process, what to pack, and FAQs about The Wave here. 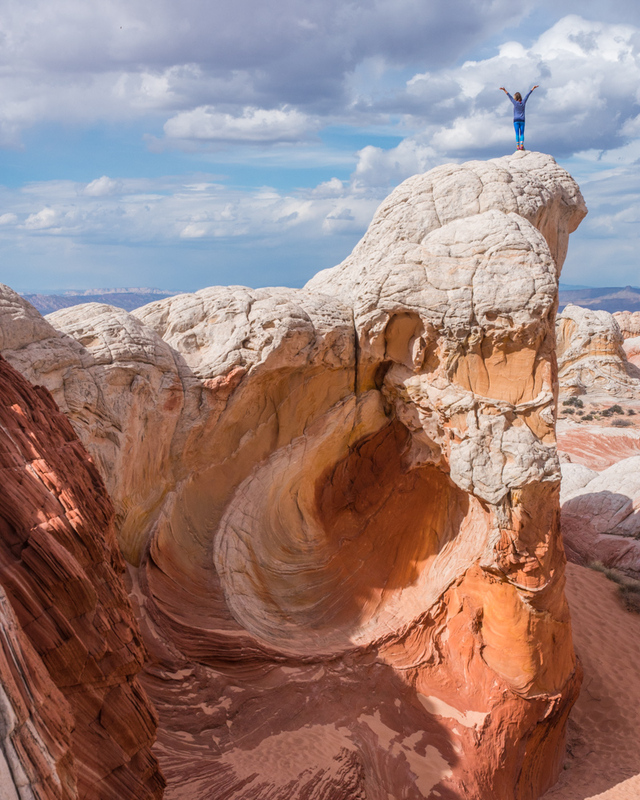 The Coyote Buttes are open year-round for visitors. However, the road to reach them gets muddy and deeply rutted after any amount of rain or snow so you’ll need 4-wheel drive and high clearance to get to the trailhead for each. Your chances of winning a permit are higher in January and February as those months aren’t nearly as popular. If you apply for the in-person lottery and win a permit, you’ll pay $7/person for the North Buttes and $5/person for the South Buttes. If you apply for the North Buttes online, you’ll need to pay a $5 non-refundable application fee. White Pocket is a small, compact area located in the Vermilion Cliffs National Monument area (near the Coyote Buttes) where the rock formations resemble what you’d imagine Venus or Mars to look like. Strange layers of foam-looking white rock mixed with bright orange swirled formations will have you mesmerized. There are no rules here, you can scramble up and down and around to your hearts delight. It’s a magical place to get lost exploring. The entire area is only about one square mile in size so it’s easy to explore by foot. It’s incredibly difficult to get to which is why it only attracts a few daily visitors. You probably won’t see another soul the entire time you’re there! 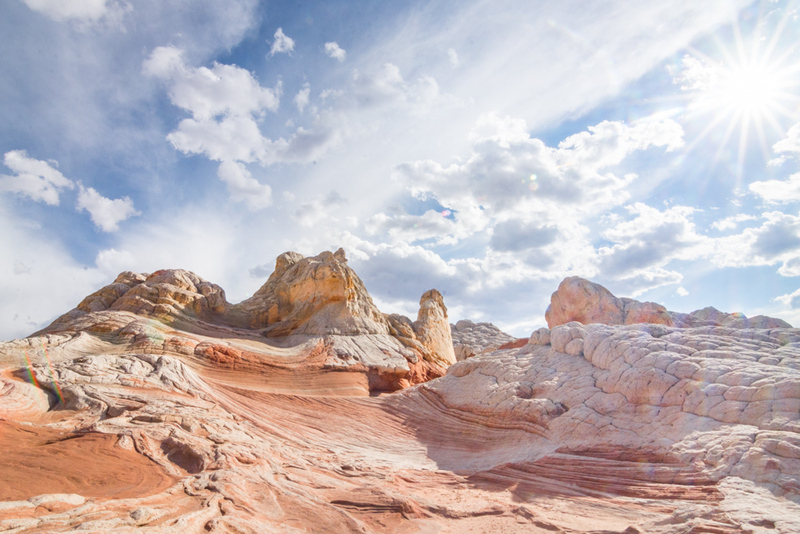 28 Photos of White Pocket, Arizona That Will Blow Your Mind! 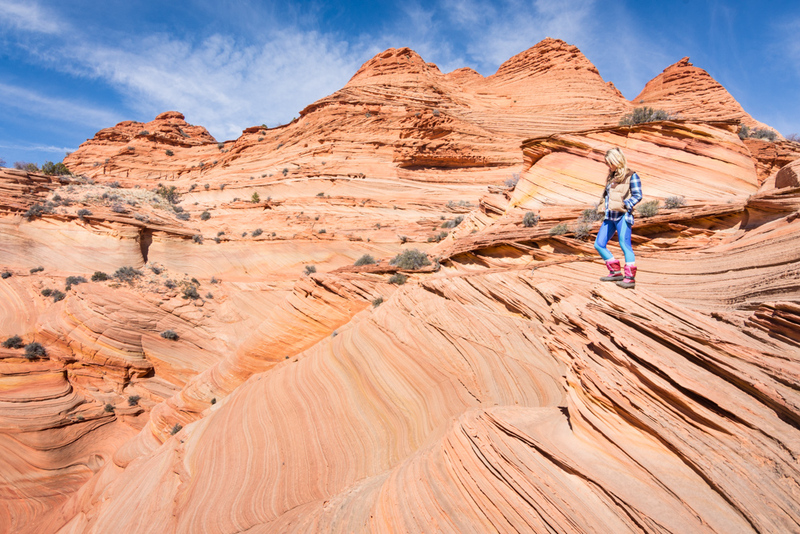 Of all of the hiking attractions in the Vermilion Cliffs National Monument area, White Pocket is probably the most difficult to access. If you’re coming from Kanab you’ll take US 89A to House Rock Valley Road (the same road you’ll take to get to Coyote Buttes North). There are several turns you’ll need to make down unsigned roads so you should get the specific driving instructions from the BLM office in Kanab (Address: 745 E. Highway 89, Phone Number: (435) 644-1300) prior to setting out. You’ll be out in the middle of nowhere and occasionally driving through deep sand so be sure to bring the GPS coordinates, specific driving directions, topographic map, extra food and water, and a plan in case your car gets stuck. If you try to get to White Pocket after it’s been raining or snowing, the road will be a mudpit. Regardless of what kind of car you have, road conditions will be nearly impossible. If it’s raining or if it’s rained in the past few days it’s probably not a good idea to risk it. You can check on the road conditions at the BLM office in Kanab. The Grand Canyon was formed by many years of erosion by the Colorado River, snaking its way around and taking layer after layer of sediment with it. Today the canyon is 277 (river) miles long, 18 miles wide at points, and a mile deep. Standing at the top of one of the many viewpoints in the park, it’s still difficult to wrap your mind around the sheer size and vastness of it. It leaves you in awe of Mother Nature and the power that one river had to create such an amazing place. 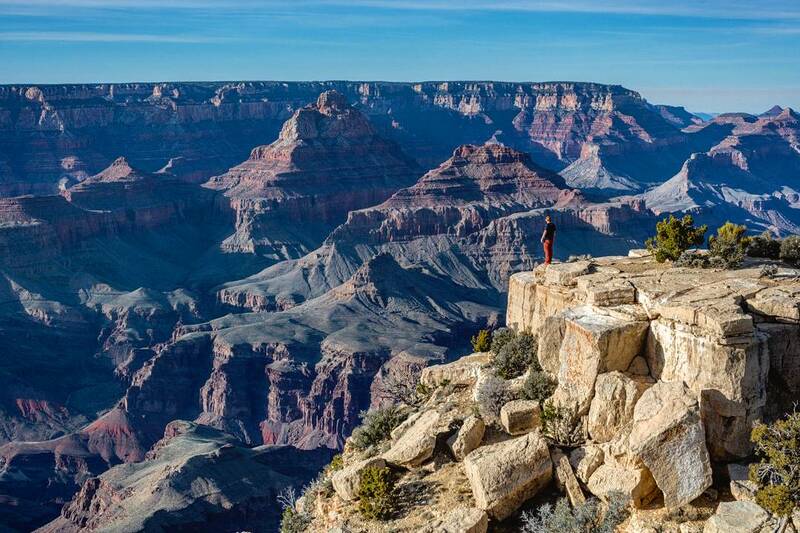 There are several hiking trails, hotels, restaurants, and museums sprinkled throughout the park but the most popular activity is to explore the many viewpoints of the area to take in all of the beauty that the canyon has to offer. Sunrise and sunset are especially beautiful here as the colors of the rock are hazy-looking and pastel-colored against the soft sky. 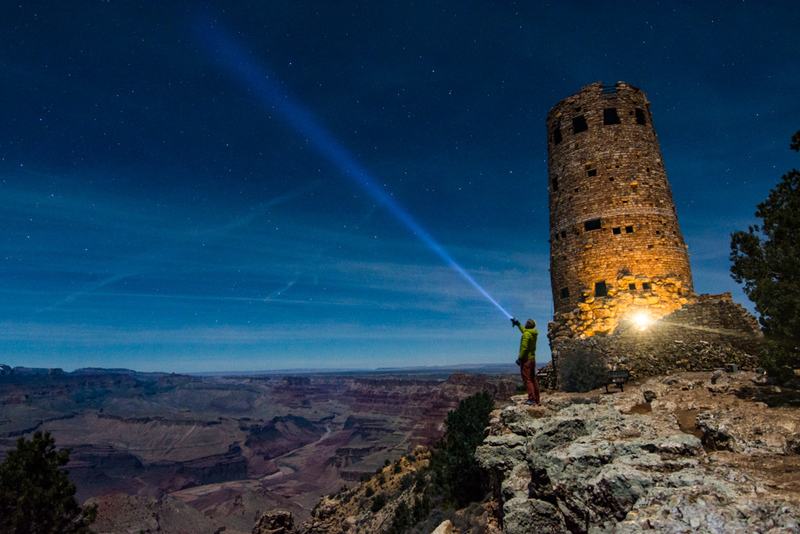 Don’t miss the Desert View Watchtower which is one of the classic iconic sights of the park. You can climb to the top for even better views of the canyon below. Or visit at night when the tower is lit up against the night sky. The South Rim of the Grand Canyon is located in the Grand Canyon National Park and is about halfway between Sedona and Page, Arizona. From Sedona you’ll head 120 miles north and from Page it’s about 119 miles south. 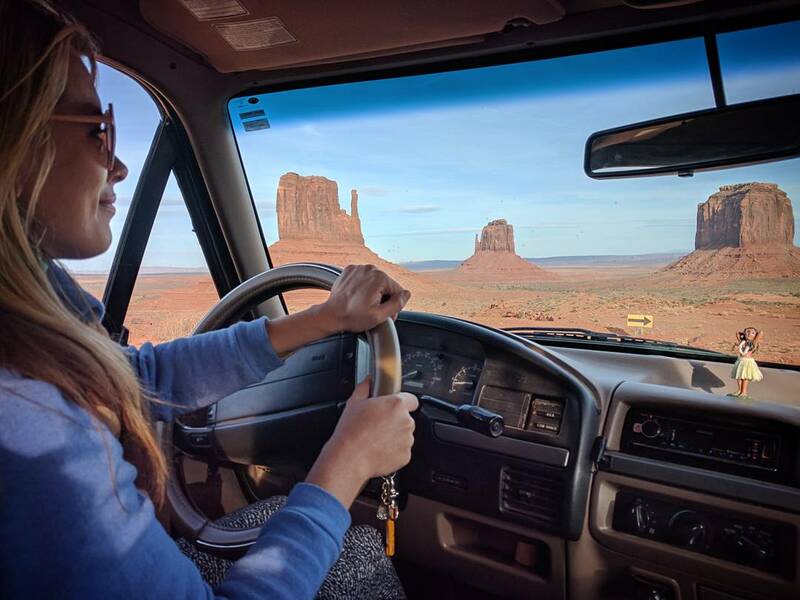 Once you enter the park you can self-drive around the rim to the various viewpoints or you can park and take advantage of the free shuttle bus. If the park is crowded you’ll probably find that the shuttle is an easier way to get around so you don’t have to deal with trying to find a parking spot. The South Rim is open year-round although as with most national parks in the US, it gets quite busy in the summer when kids are out of school. Early spring or late fall are pleasant times as there are fewer visitors but the weather is still nice. Winter road closures due to snow may affect your ability to visit areas of the park so stay up-to-date here. The Grand Canyon is part of the National Parks system so you’ll be required to pay $35 per vehicle (that fee includes all passengers). The pass is good for 7 days and includes both the North Rim and the South Rim. 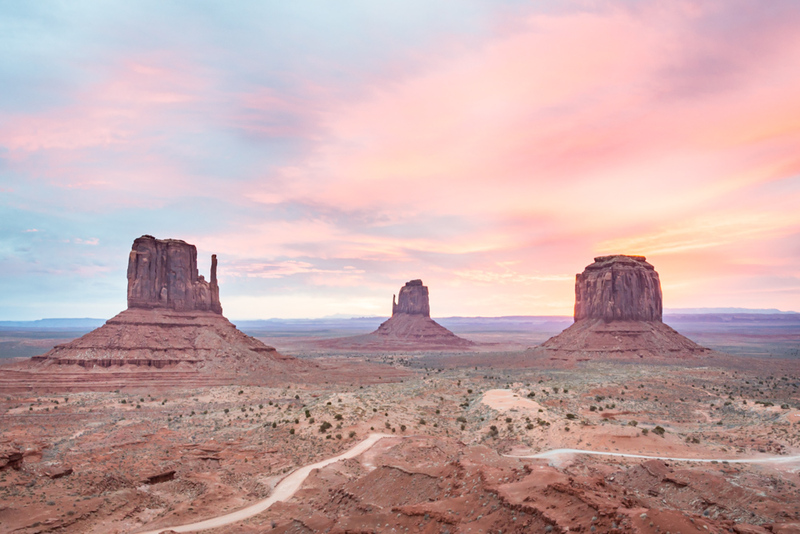 The massive rock formations jutting up from the valley floor in Monument Valley are an iconic symbol of the American West. No doubt you’ve seen cowboys riding through them on horses in countless country Western movies. In fact, famed director John Ford filmed parts of 9 different western films here including Stagecoach and The Searchers. And when you’re here it even feels like you’ve traveled back in time to the wild wild West, bumping along the dusty dirt road of this rugged and desolate terrain. The entire valley is filled with towering sandstone formations that rise 400 to 1,000 feet above you. The colors of the stone change from bright orange during the day, to softer pinks and purples during sunset. One of the best views of the park is from The View Hotel which is where you can book a tour or a campsite as well. Spend a few hours exploring the park in your car, but be sure to make it to a viewpoint for sunset, it’s truly breathtaking! You can either self-drive the 17-mile loop around the park but the road is rough so only attempt if you have good suspension and preferably high clearance. Small cars can make it but need to take the bumps very carefully. You’ll stop a lot for photos and some short walks so plan to spend at least 3-4 hours here. If you don’t have a car that you feel comfortable driving though the park, you can hire a local guide for a half-day or full-day jeep tour. They can actually take you on some roads where normal cars can’t go so you can get further off the beaten path by going this route. 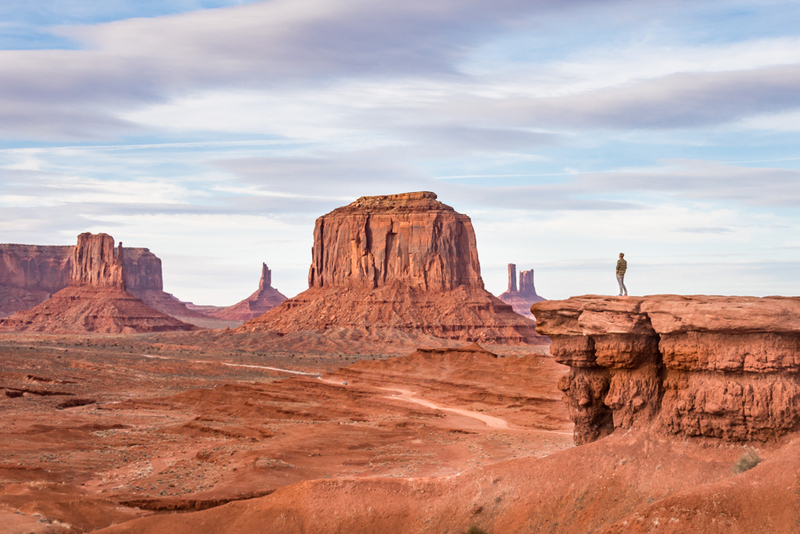 Peak season in Monument Valley is April to September when temperatures are warm and skies are clear. You’ll find fewer crowds in the off-season. Opening hours vary throughout the year so stay up-to-date here prior to setting off. The entrance fee is $20 per vehicle for up to four people to enter the park. Each additional person will be charged $10. Devil’s Arch is one of the many hikes that you can do in the darling little town of Sedona in Northern Arizona. Sedona is truly an outdoor adventurer’s ideal vacation spot as the weather is amazing and the landscape is spectacular. Plus there are so many delicious restaurants, cute boutiques, and lively breweries, you’ll never want to leave! The hike to Devil’s Arch is 4.2 miles round trip and is moderate in difficulty. It gets fairly steep near the end but once the view of this natural sandstone arch comes into view you’ll know that all of that huffing and puffing was well worth it. The bridge is easy enough to walk across assuming you’re not afraid of heights. Or simply sit for a while and gaze at the beauty that surrounds you. 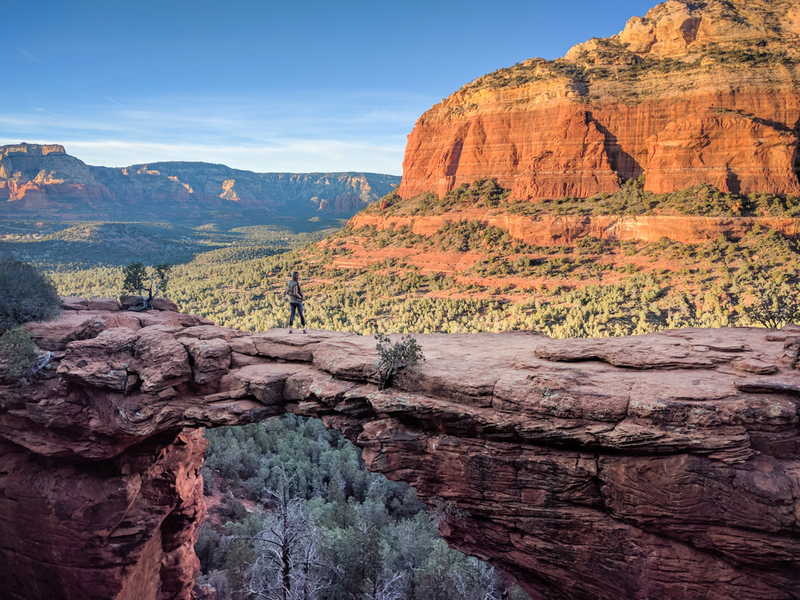 The official trailhead for Devil’s Bridge is about a mile from the paved road on Dry Creek Road and you’ll need 4-wheel drive and high clearance to access. If you have a smaller car, simply park at the Dry Creek Road trailhead on the paved section and walk. The hike is 4.2 miles roundtrip from the official trailhead. It starts out relatively flat and gets steeper as you go on. The most popular time of year to visit Sedona is in the spring and fall when temperatures are moderate (60 °F – 80 °F on average). Summer months can be incredibly hot (though still cooler than neighboring Phoenix) and winter months can get quite cold. But if you visit during these times you’ll find fewer crowds and more competitive hotel prices. 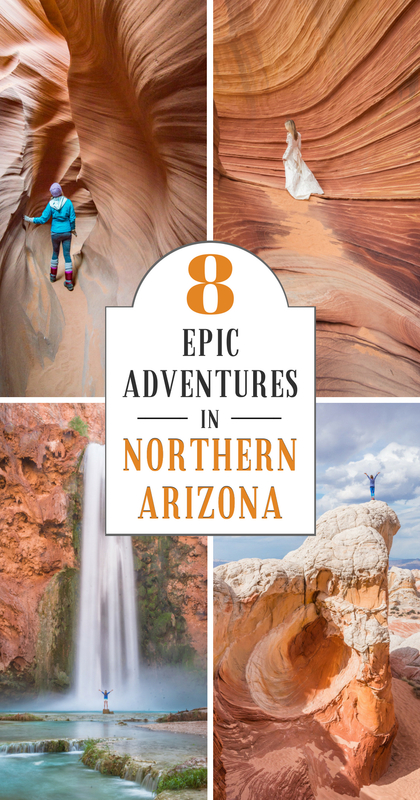 Want more adventures in Northern Arizona? Check out our favorite travel guides! Sign up and get epic stories, detailed travel guides, and beautiful pictures delivered straight to your inbox!